The 1031 Exchange Advanced Class is designed for experienced realtors who have taken our 1031 Exchange Basics class or 1031 Exchange Basics for Real Estate Agents class. You'll broaden your understanding of the benefits and application of 1031 exchanges. 3 CE credits. Your 1031 Exchange Advanced class instructor is an experienced, 1031 exchange facilitator in your area. 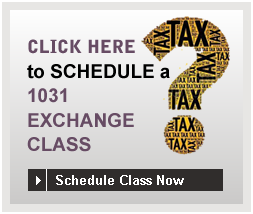 Click here to schedule a 1031 exchange class in your area. Classes available in California, Nevada and Washington.